This revolutionary custom-blend hydrator gives you the power to hydrate and treat your main skin concern, your way. The Active Cartridge Concentrate for Pores & Uneven Texture delivers concentrated actives, including AHAs, to reduce the look of pores and retexturise skin. Add it to your hydration base to create your Clinique iD. Concentrated actives in the cartridge visibly reduce the look of pores and retexturise skin. With continued use, see visible improvement in skin texture. Delivers 24-hour hydration repair plus pollution protection. Clean Shield Technology locks in the good—like moisture—and filters out the bad. Strengthens skin’s moisture barrier and improves resiliency. Unique water-jelly texture feels fresh, penetrates quickly. AHAs help retexturise skin, reducing the look of pores. Custom-Blend Chemistry Technology isolates the concentrated actives in the cartridge from the base—delivers optimised results with every pump by freshly combining the precise dose of concentrated actives and base for the ultimate customised experience. Water\Aqua\Eau, Butylene Glycol, Sodium Hydroxide, Glycolic Acid, Lactic Acid, Pentylene Glycol, Caffeine, Laminaria Saccharina Extract, Caprylyl Glycol, Dimethicone, Dimethiconol, Laureth-23, Laureth-4, Taurine, Xanthan Gum, Disodium Edta, Potassium Sorbate, Phenoxyethanol, Ext. Violet 2 (Ci 60730), Blue 1 (Ci 42090). 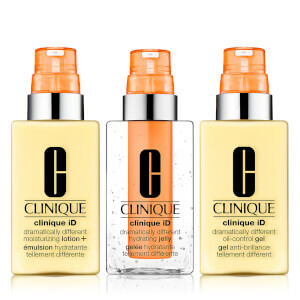 Select your free Clinique Duo Kit at checkout with any Clinique iD purchase - no code required. While stocks last.